Let’s take a look at the finished piece of Caoimhe’s Sunday Sweater. 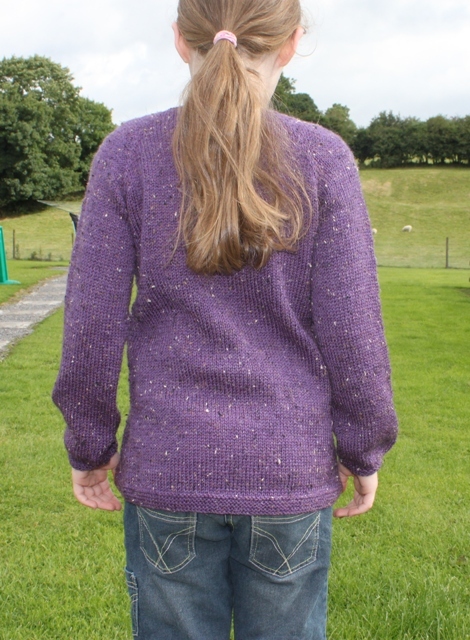 The pattern I used was Sunday Sweater by Ginny Sheller, the pattern can be found here. This cardigan is a seamless knit in the round top down cardigan with very little finishing off to do once you reach the bottom. 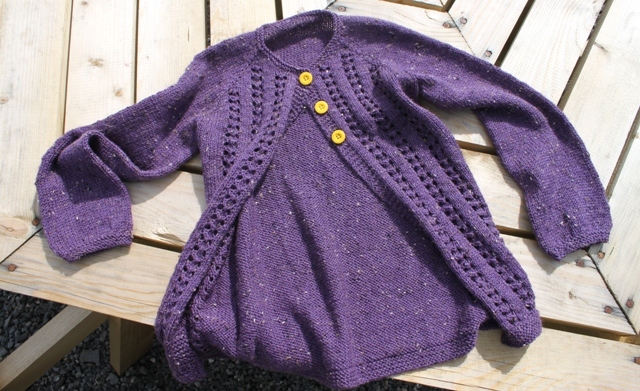 Not having any worseted weight yarn at hand for this cardigan I used a dk purple tweed yarn that I had. 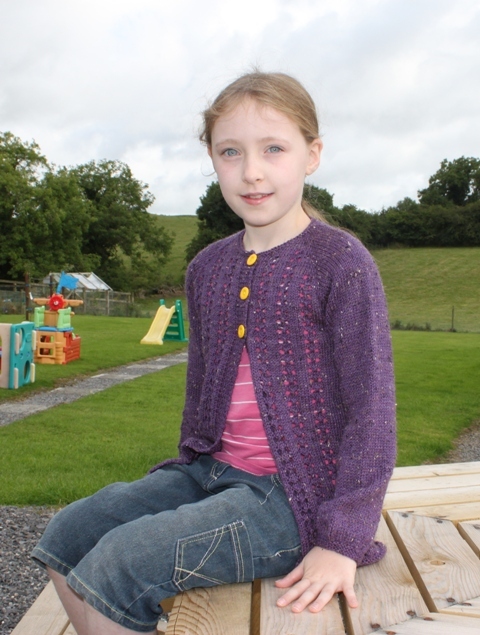 I had to do some playing around with figures as Caoimhe only measured to the size of the 6 year old in this cardigan. That’s not the cardigan she measures that small on all cardigan and sweaters, she’s just so slight for a 10 year old. 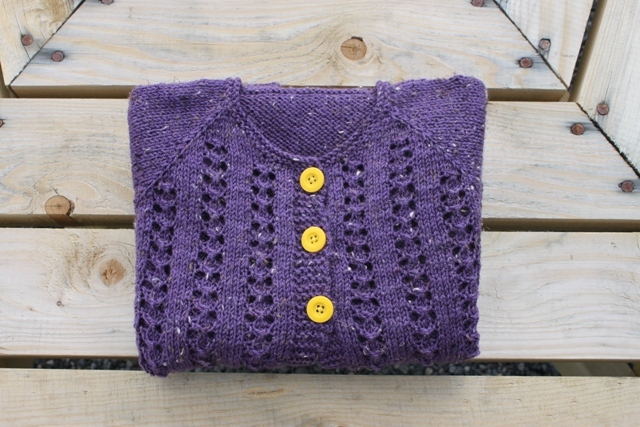 After browsing through the notes for this cardigan most people who used a dk weight yarn knit two sizes bigger and all had success with it fitting their intended size. So I cast on for the 10 year old with the hope that it would indeed fit nicely and not just look like a tent on her. This is the sweater before blocking, where it just fit nicely for now so the figures did indeed work out. I decided to block it out to gain just an extra inch or two for growth over the winter months. As you can see just enough to not swim but to get her through the winter. Thank you to all who wrote notes on what they did when they started their projects on Ravelry they really were invaluable and something I must make a conscious effort to do myself especially when making changes to an item, it may help someone else in the future. While knitting this I wanted a pop of colour to happen in the buttons and after consulting with Caoimhe on what colours she might like and a browse in my lys I found these bright eye-popping yellow, which I zoomed in on immediately. I just love the pop and zing of the yellow against the purple. My notes and project page on Ravelry for this project can be found here. 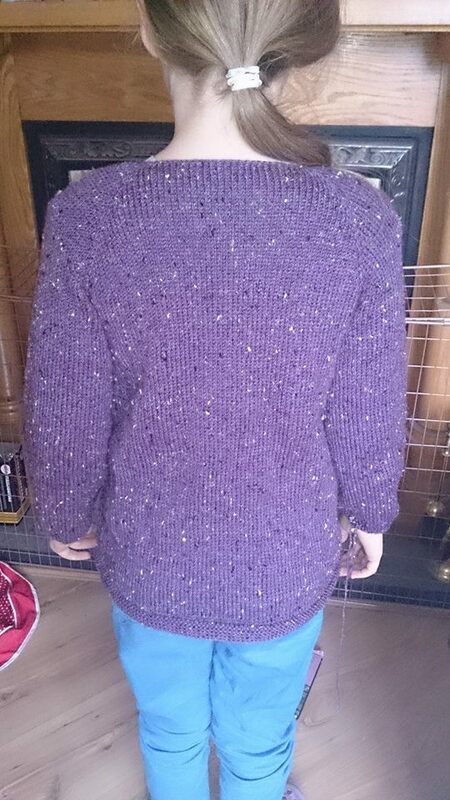 This entry was posted in Finished object, Knitting and tagged Caoimhe's Sunday Sweater, Finished Object. Bookmark the permalink. Love everything about this sweater! Gorgeous little miss here. I really like those lacy panels and yes, the yellow is the right zing. Gorgeous, she looks so serene! 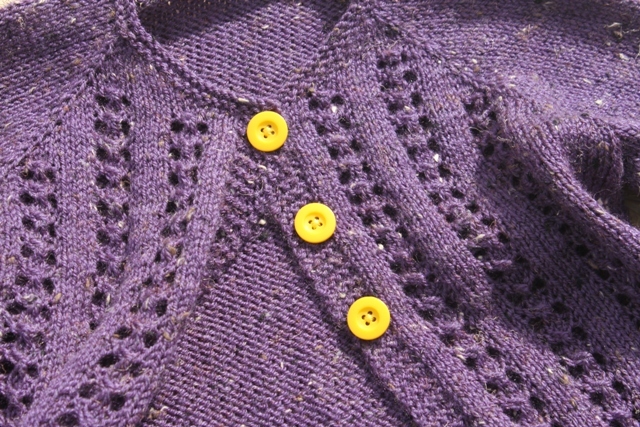 Love the buttons and the colour of the yarn. Love the purple and yellow! Beautiful work! It fits perfectly while allowing for some growth. I also absolutely adore your button choice, I think it adds to much to the overall result. Thank you, I have to say the yellow buttons are perhaps my most favourite thing about the sweater.